This review was published in Viewpoint: On Books for Young Adults in 2003. This is pretty much the same sequence of reactions I had myself when I saw Saving Francesca listed in Penguin’s forth-coming titles mailout a few months ago. Initial excitement — then anxiety. It’s been ten years. It’s the author of Looking for Alibrandi, one of the most beloved Australia YA books ever — a phenomena, indeed, in a country not prone to publishing phenomena. What if it’s dreadful? What if it’s even just ordinary? What a let down! How embarrassing! And so it’s with some relief and great pleasure that I can report that Saving Francesca is neither a let down nor an embarrassment. (Nor is it, contrary to the Sydney Morning Herald’s headline, “Looking for Alibrandi Part 2” — but more on that later.) Rather, Saving Francesca is the work of an accomplished and mature writer, a testament to the ten years Marchetta spent not rushing in to print to capitalise on Alibrandi’s success. 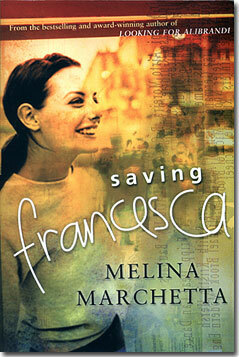 Saving Francesca takes place over the middle two terms of the year Francesca Spinelli is in Year 11. She’s at a new school, St Sebastian’s — her old school St Stella’s only goes to Year 10. All of Francesca’s Stella friends have gone to Pius Senior College and Francesca is adrift without them. Worse, Sebastian’s has until this year been an all boys’ school, and the boys (and some of the teaching staff) aren’t taking too kindly to the new intake of girls into the senior school. All of this is bad enough — and then Francesca’s mother, the bossy, over-bearing, controlling but deeply loved and relied upon Mia, has taken to her bed. Mia is seriously depressed and it looks as though Francesca’s family — and Francesca’s fragile sense of self — may not survive her mother’s illness. Macquarie University’s Professor John Stephens claims the “abiding ideal of adolescent fiction” is “the emergence of subjectivity as a development of a central character’s ability to express self-recognition or agency”. If Stephens’ claim is accurate — and a quick mental survey of YA fiction both recent and historical would suggest it is — then Saving Francesca serves as an example par excellence of the genre. At the heart of Francesca’s story is her long and painful rediscovery of the self she abandoned years ago. I want to be an adjective again. A nothing. A nobody. A no one. She is, however, a fascinating narrator. Told exclusively in the first person, Marchetta employs a clever use of flashbacks — Francesca’s imperfect memories — to explore Francesca’s shifting understanding of herself and of her family and friendships. It quickly becomes evident that Francesca’s not the most reliable of narrators — but this is a reflection of her mental and emotional state rather than an attempt to evade or deceive on her part. On the one hand, Francesca considers herself invisible and ineffectual, yet her self-deprecating humour and knack at getting into clever, witty strife with the very people she ought to stay on the good side of — if she wants a quiet life, that is — reveal someone quite different from the young woman so insecure she introduces herself to her friends on the phone with her full name. Her early sparring matches with House leader Will Trimbol — who she will eventually fall in love with — and with the despotic Mr Brolin (despite being invisible, Francesca can’t seem to stay out of detention) — are classic Marchetta in terms of their humour and revelation of character. Francesca may tell us she’s someone with nothing to say, but she gets herself into a hell of a lot of trouble “not” saying it. Marchetta’s realisation of the school scenes are masterful — her years teaching have given her a shrewd insight into classroom dynamics. Francesca has evidently spent all of Term 1 assiduously avoiding being friends with any of the other girls at Sebastian’s — including her Year 7 “horsie” friend Siobhan and a handful of other Stella girls. She finds the Sebastian boys distasteful at best, and disgusting most of time. But despite her resistance and resentment and the lingering influence of her Stella friends — the ones who “rescued” her — Francesca finds herself building an initially tenuous, but ultimately incredibly powerful set of friendships with both boys and girls — and learning about the true nature of friendship as she does. Family is also critical to Saving Francesca. In addition to Francesca and Mia there’s father Rob and little brother Luca, and the posse of extended Italian relatives. The main interest here is how Mia’s depression affects the family and eventually changes the family dynamics for ever — and for good. Francesca has had a difficult relationship with Mia and she’s deeply ambivalent about her mother’s depression — she’s angry, scared, compassionate, impatient — everything you’d expect a 17 year old to be. She adores younger brother Luca but develops an intense antagonism to Rob, who she comes to blame for Mia’s illness. The adults in Francesca’s life are flawed people — Rob, for instance, has Francesca ring Mia’s work colleagues to explain her absences and illness — and it’s largely through her own will and with the support of her new friends that Francesca learns and grows. How Francesca’s family will re-make itself is left open at the novel’s end, but there’s a strong sense that their fundamental love and respect for each other — and the hard lessons learned — will pull them through. Marchetta employs popular culture in a most interesting way in Saving Francesca. Most YA novels that drop in references to a poster of a (real) band on a wall or a character’s favourite actor threaten to date quickly. Saving Francesca has numerous references to actual popular culture — punk band One Dollar Short, “Buffy the Vampire Slayer”, for instance — but they are embedded in the meaning of the text. Rather than being one-off references to establish the novel’s (possibly short-lived) credibility with the readership, Marchetta uses the centrality of popular culture to young people’s lives to explore her interest in the power of family and the nature of friendship. In fact, it’s so important to the novel that it informs the book’s very design — the first page of each chapter features the names of various alternate contemporary bands and musicians in greyscale behind the text. Popular culture in Saving Francesca bonds friendships (after finding out Will Trimbol has a girlfriend, Francesca’s new friends cheer her up with a night of Alanis Morrissette and the Colin Firth “Pride and Prejudice”), represents a character’s frame of mind (Francesca’s misery at being sent to stay with her grandparents is made worse by them not letting her watch Buffy the vampire Slayer — emotional torture! ), and acts as a shorthand to exemplify a point (Francesca’s memories of her family singing a Whitlams song together is a powerful pointer to what they’ve lost). Time will tell how these references are received by future readers, but my sense is that their meaning and use are so clear that it will over-ride any problems of transitive popularity. I’m full of admiration for Saving Francesca. It’s beautifully structured and has remarkable depths that emerge on subsequent readings, it’s written with a mature hand and heart, it’s painful and moving, it’s funny and true. There’s also a feisty sense of social justice and a feminist sensibility underpinning this book, and it’s a pleasure to read forth-right, opinionated and informed teenaged characters in a time when many would like to see young people silenced. In an interview in the afore-mentioned Sydney Morning Herald (Spectrum, April 5-6, 2003), Marchetta stated “I knew, as soon as Alibrandi came out, that my competition was not going to be any other writer, it was just going to be this novel.” It would be a shame indeed if Saving Francesca were viewed only in terms of its enormously successful and beloved predecessor, despite some superficial similarities. Let us hope that, like its protagonist, Saving Francesca finds its own place in the world, on its own fine, compelling and independent terms.